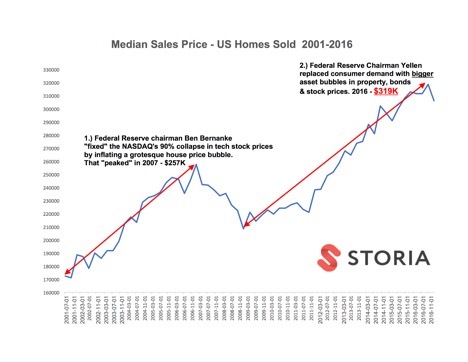 During the past eleven years, we have witnessed unprecedented manipulation of stock, bond, and property prices by global central banks. The inflation of these grotesque asset bubbles will not end well as indicators in the USA point towards an economic recession. The biggest problem is that inflation-adjusted wages have been flat while central bank manipulation has inflated unsustainable asset bubbles in stocks, bonds, and property markets making the cost of living impossible. As wages have stagnated, DEBT HAS DRIVEN consumption—and the consumers are now tapped out. The claim that the USA’s economy is at “full-employment” is one of the century’s most risible claims. Labor participation has not been this horrible since 1977! The likely outcome of the Bernanke-Yellen “great economic experiment” is the USA’s loss of USD hegemony followed by a massive global financial collapse, a catastrophic economic depression, and possibly another world war. But rest assured that when, not if, the next crisis hits, our fake-news pundits will all blame the above and the thirty plus years of excess on President Donald J. Trump. Central bank “interventions” have allowed market valuations to enter the Twilight zone, a place where reality no longer exists. The US Treasury is about to run out of money and Illinois is broke as are most woefully underfunded USA pension funds, and yet disconnected markets trade like they are playing with risk-free assets. These central planning interventions have created an exquisite garden paradise where princes and princesses happily gallop along riding their unicorns without a care in the world because the omnipotent central bankers have eliminated all political, monetary, geopolitical, fiscal, and economic uncertainties in the stock, bond, and property markets. A wonderful world where prices can only go up, up, up! In Bernanke, Yellen and New York Federal Reserve Bank President Bob Dudley’s version of utopia, everyone remains convinced our central bank super heroes can easily unwind the Federal Reserve’s $5-trillion-dollar balance sheet with no harmful side effects. In fact, as Yellen cited last week, “It will be like watching paint dry.” Will our divine soothsayer’s forecasts be just as accurate as their asset price, growth, and inflation guesses have been for the last several decades? Does anyone remember this July 2005 interview with U.S. Federal Reserve Chairman Ben Bernanke? So here is a snapshot of the USA’s property market. Similar property bubbles exist in Canada, inflated by Mark Carney, who is now at the helm of the UK’s BoE where the central London property bubble he helped inflate will experience an extreme collapse. What could possibly go wrong? 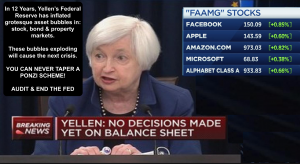 Have global markets finally reached a zenith after the multi-decade enterprise of monetary central planning engineered by the Bernanke-Yellen Fed using the same groupthink policies adopted by central bankers around the globe that helped spawn the last credit crisis bubble? Have these central bankers all become intoxicated by the same monetary madness? 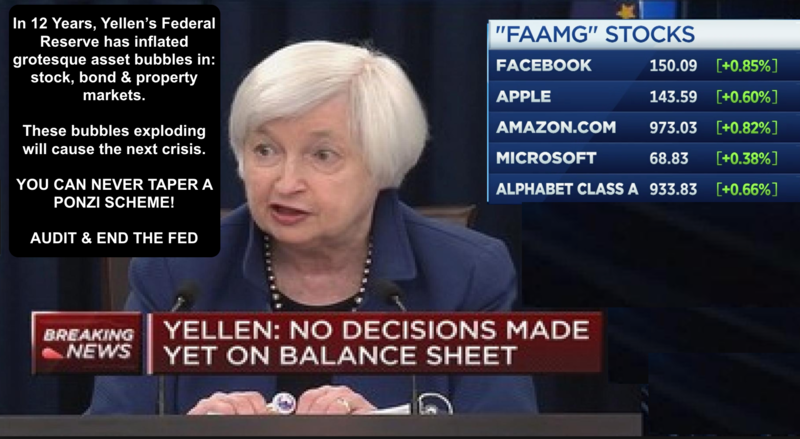 Albert Einstein said, “Insanity is doing the same thing over and over again and expecting different results.” Well, our central bankers either have been lying to us for the past decade or they have been dead wrong. In either case, why should a sane society entrust our global financial stability to nonelected officials who have made heinous mistakes and have been wrong more than they have been right over that past thirty years. Central banks are picking market winners and losers—that’s no longer capitalism. Central banks are making wildly speculative bets. For example, take a look at the Swiss National Bank’s gargantuan stock positions (nearly $70Billion) in US companies such as Apple, Facebook, Boeing, Tesla, Microsoft, and Amazon. The European Central Bank has manipulated the European Union sovereign bond market to the extent that price discovery and normal functioning market mechanisms no longer exist. The Bank of Japan has experienced three lost decades destroying their economy. Is it different this time? Sorry folks, it is never different not this time or anytime. Has the West learned anything from Japan’s nearly thirty-years massive policy failures? Nope. In fact, central banks have recklessly tripled down. Central banks have become nothing more than highly opaque, out-of-control hedge funds with unlimited balance sheets run by people who arrogantly believe they can control volatility and markets by distorting reality with no consequences. What’s next? We needed to rein in these rogue central banks years ago. But, it’s too late. When people do wake up they will realize how decades of central bank policy mistakes have caused the biggest financial collapse in history.